MARINA Conference 2018: CALL FOR PAPERS now open! 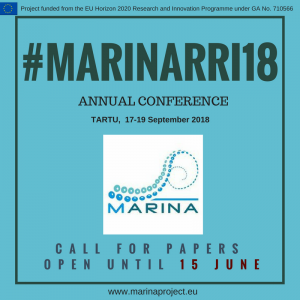 Now open the call for papers for the MARINA Annual Conference, titled “Marine Responsible Research and Innovation in Science, Innovation and Society”, to be held in Tartu, Estonia, 17-19 September 2018, hosted by the Science Centre AHHAA. The deadline for abstract submission is 5 of June, the deadline for paper submission: 15 of June. The concept of Responsible Research and Innovation is relatively recent and it is part of the Europe 2020 strategy. Its vision is to promote a stronger collaboration among scientists from different disciplines, societal actors, citizens and policy makers in order to achieve a wider dimension of science and innovation and enhance the role of society in dealing with its challenges. Continue reading MARINA Conference 2018: CALL FOR PAPERS now open!